Mailchimp is an incredibly powerful tool – whether you’re using it as the free version, or the paid version, you can do a couple of really neat things with it. One of the most powerful is welcoming new subscribers. Paid Mailchimp subscribers can set up auto responders to send out an email to subscribers as soon as they subscribe. But there is a way to almost duplicate the same action on free Mailchimp. Why would I want to do it in the first place? In short, welcoming your subscribers comes in two parts – confirming the ‘opt-in’, which you can edit in the settings, which I’ll explain at the end of the article, and more importantly, you can tell Mailchimp to send emails to people who have subscribed since you sent the email the last time. You can then use this to welcome people, ask them for feedback, give them a freebie – we use this function on the Indie Author Group mailing list (which I log into once a week), to send out freebies. Segmenting, in Mailchimp is incredibly powerful – you can set up groups of subscribers who signed up in a specific place, and are entitled to a specific offer – by genre….by need. By the book they signed up after. But segmenting also looks at specific criteria, such as the date emails have gone out. 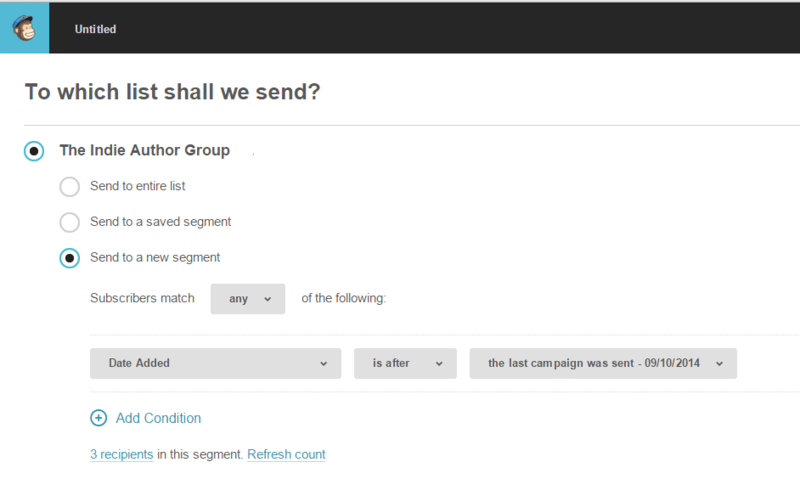 Log into your Mailchimp account, and start a campaign as normal, and head into your campaign setup. Skip through the regular ‘ol campaign option. The first time you email this out, it goes to the whole of your list. Thereafter, set your calendar to log in once a week and check if you’ve had more subscribers. As you can see below, we’ve not needed to send since the beginning of October on the Indie Author Group. But we’ve got three new subscribers, YAY! When setting that up, it will auto populate, based on the choices you make. The dropdown will let you do this – just look for ‘since the last campaign was sent’. If you save this, you can then simply tell it to use a saved segment, and it’s a few clicks. You then paste what you want to send (so save it somewhere if it’s your welcome email – or duplicate it from the last time if you like (instead of telling it to create a new campaign, look at your email list and choose a campaign and copy it, setting it up as normal). And, I mentioned setting up a message in the ‘thank you for subscribing’ section, didn’t I? Go to Lists – Signup forms – General signup forms and hit select. In there, you’ll find your signup form and all sorts of other goodies in the dropdown. Do be aware of what needs to be included when editing these, but have fun! What do you think? Can you think of creative ways you could use this? Got an idea of what you’d like to do but not quite sure how? Comment below!